Canadian-born Cree singer-songwriter Buffy Sainte-Marie is a living legend, famous for such Indigenous anthems as “Universal Soldier” and “Bury My Heart at Wounded Knee.” But few know that Sainte-Marie led the earliest charge into electronic music at the same time she was being celebrated worldwide as a “folk” artist. She’s now preparing to make her first album since the award-winning 2008 relase Running For the Drum. Speaking from her current home in Hawaii, Sainte-Marie gave ICTMN the lowdown on the directon she’ll be heading with her new music. This is the second of a three-part series; for the first, which focused on her thoughts about the environment, see Buffy Sainte-Marie on Tar Sands: “You’ve Got to Take This Seriously”.Do you know when your new album is due to come out? Is there a title?We haven’t decided. I just spent three weeks out on the road in Nashville, Toronto and L.A. auditioning producers, so I have not yet made my choices. I don’t know if I’ll work with several producers or just one. But I’m sure excited about the music. We’re choosing from about 30 different songs. It’s going to be fun. It’ll be done when it’s done! Your last album, of course, got a Juno as well as an Aboriginal People’s Choice Award (and around that time you were inducted into the Canadian Country Music Association Hall of Fame) — in many ways, it was a departure from your other work in the immediacy of it.You think so? The songs, as always, were very diverse. I wasn’t worried about trying to make them all the same. Some of those songs I had in the can for a long time, and some were things I’d written over the years. I’d take something I’d written in my notebook in 1970 and I’ll add a second verse in 1980 and I’ll finish it last week. That’s always how it is for me – I have a kind of helicopter vision of life itself. I don’t think about calendars, deadlines or styles. I just play and sing whatever I dream up. Writing for me is just really, really natural. It’s the same as it was when I was a little kid. I hope I’m getting better though! There’s an immediacy to your sound that really speaks to today. But you’ve always had that along the way. A lot of people were a little bit surprised hearing me with electronic sounds, but that’s because they maybe hadn’t heard about me for a while – so it might have been new to them, but it wasn’t new to me. In 1965, I made the first-ever electronic quadraphonic (four-channel) vocal album, Illuminations. Is there anything about your new album people should look out for, in terms of style or subjects you’re addressing? Any surprises? It depends. Most people don’t listen to me, so they’re always surprised! (Laughs) Especially if they think I’m a folk singer. But people who have been listening all along will be surprised, because the whole world continues to grow. And that includes me and you. So it will be different. “The Uranium War” is one song, another is “Look at the Facts,” “Your Link with Life” is another. There’ll be some remixes… It’s a really interesting album. There’s some love songs on it, and some Aboriginal things, but mostly it’s just solid songs that are good to dance to or fun to listen to, or whatever. One of your most famous songs, ‘Up Where We Belong,’ has really been turned into a love anthem. But it has such a special meaning for many Indigenous people, who can read it in a completely different way from non-Indigenous people. What are your thoughts on that? It’s a beautiful love song, but from the perspective of history suddenly it gives you a chill down your spine. I’m glad that it got to be the main theme for the film An Officer and a Gentleman, that’s about the military. Because sometimes people are surprised to see how many veterans come to my concerts, and to find out that soldiers in Vietnam were carving “Universal Soldier” into their bunk beds. If you think pacifists and military people hate each other, it’s not true. That’s just not accurate at all. The fact that “Up Where We Belong” – a love song that does have a real double-entendre meaning – was heard by so many people who don’t ordinarily come to hear me — how good is that? We always have to remain open to the fact that audiences are going to interpret your songs personally for themselves. I think that’s the true power of songs. It’s wonderful… Music has always been a powerful medium, and now with the Internet it can reach so many more people. 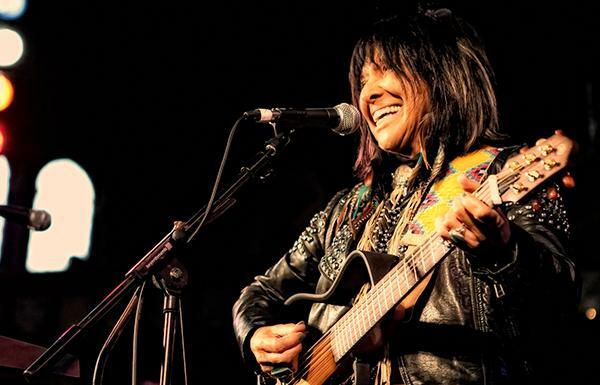 To keep up with Buffy Sainte-Marie, follow her on Twitter @buffystemarie and at facebook.com/BuffySainteMarie. This entry was posted in Arts & Entertainment, Top Story and tagged artist, Buffy Sainte-Marie, Indigenous, music by Kim Kalliber. Bookmark the permalink.